Even though it’s phenomenal that some companies are doing so much more than what’s required, I think there’s still a strong need for a very aggressive government influence. Traditional fossil fuel and electricity markets have seen a gradual shift over the last few decades from heavy regulation to market-driven incentives. As a result, corporate leaders have been stepping up with more ambitious energy plans and targets. Big Oil is a great example. Some of the world’s largest oil and natural gas companies have been taking a much greater interest in environmental issues. “Big Oil is by no means the biggest roadblock to environmental regulation today,” said Arthur van Benthem, assistant professor of Business Economics and Public Policy and faculty fellow for the Kleinman Center for Energy Policy. Many of these companies have become neutral about regulations — and some have even become advocates for carbon taxes. “The most interesting reason that’s happened is not that they’ve suddenly become charitable institutions, but they’ve better aligned their investments with the environmental regulations they expect,” he said. 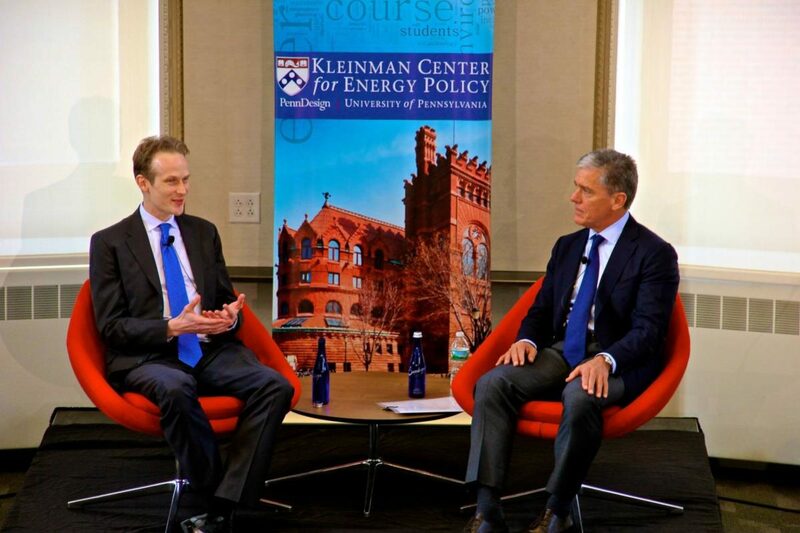 Prof. Arthur van Benthem moderates a discussion with former Shell Oil Company president Marvin Odum at the Kleinman Center Energy Forum as part of a daylong event co-sponsored with the Penn Wharton Public Policy Initiative. He sees this corporate interest in the environment as “a promising trend” but remains skeptical about leaving environmental decisions fully to companies. The research Van Benthem enjoys most involves bringing in large data sets to measure how exactly firms and consumers respond to the government’s environmental taxes and regulations. 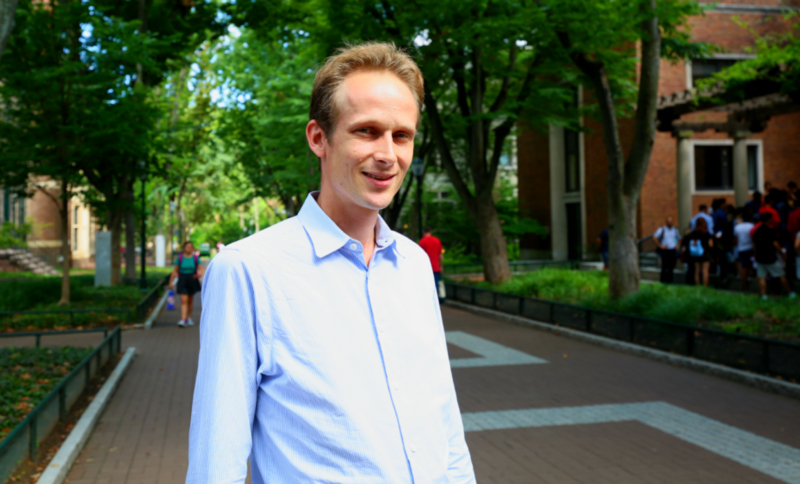 His recent research has a particular emphasis on the unintended consequences of environmental legislation, the performance of fuel-economy regulation, the economic efficiency of energy policies, and the impact of solar energy subsidies. For example, one unintended consequence of more stringent fuel-economy standards is known as “the rebound effect.” Cleaner cars are extremely cheap to drive because they consume so little fuel — so if you push consumers to use cleaner cars, they may actually end up driving more than they did in the past. Economists have estimated that for each gallon of fuel saved, fuel-economy standards are two to 10 times as expensive as a fuel tax. Van Benthem has looked at the cost of these kinds of decisions extensively in his research. Recently, he attempted to quantify the less visible impact of such higher standards on overall gas consumption and the used vehicle market. With a new administration in the White House and the potential for a very different U.S. environmental policy agenda, Van Benthem feels it’s more pressing than ever to conduct research that looks at the economic impact of the government’s regulations on energy and the environment.